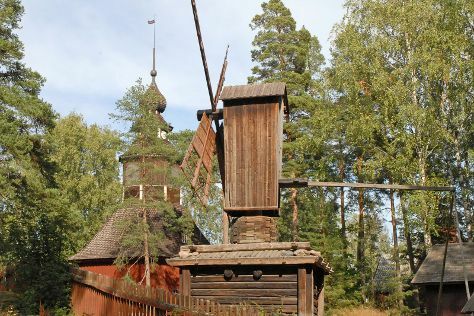 Start off your visit on the 31st (Fri): steep yourself in history at Pohjolan toimitalo, take an in-depth tour of Seurasaari Island and Open-Air Museum, and then take a stroll through Ullanlinna. Get ready for a full day of sightseeing on the 1st (Sat): wander the streets of Katajanokka, admire the masterpieces at Kansallisgalleria, and then identify plant and animal life at Laajalahti Nature Reserve. For other places to visit, more things to do, photos, and other tourist information, go to the Helsinki online trip planner . Stockholm, Sweden to Helsinki is an approximately 3-hour flight. You can also ride a ferry; or do a combination of bus and ferry. The time zone changes from Central European Time (CET) to Eastern European Time (EET), which is usually a 1 hour difference. May in Helsinki sees daily highs of 18°C and lows of 7°C at night. Finish your sightseeing early on the 1st (Sat) to allow enough time to drive to Kotka. Kotka is a city and municipality of Finland.Kotka is located on the coast of the Gulf of Finland at the mouth of Kymi River and it is part of the Kymenlaakso region in southern Finland. Popular historic sites such as St. John's Church and Kotka Church are in your itinerary. Explore hidden gems such as Linden Esplanade and Hiidenvuori. Explore the numerous day-trip ideas around Kotka: Pihamaa Estate & Winery (in Asikkala), Arboretum Mustila (in Elimaki) and Niivermaki Nature Conservation Area (in Kouvola). There's lots more to do: identify plant and animal life at Riverside Park, take in the spiritual surroundings of St. Nicholas Orthodox Church, take in the architecture and atmosphere at Marian Kirkko, and take an in-depth tour of Bunker Museum. For maps, where to stay, and other tourist information, go to the Kotka tour itinerary site . Traveling by car from Helsinki to Kotka takes 1.5 hours. Alternatively, you can take a bus. Expect a daytime high around 22°C in June, and nighttime lows around 11°C. Finish your sightseeing early on the 5th (Wed) to allow enough time to travel back home.